Happy Thanksgiving, dear listeners! Do you know what we’re thankful for? (I mean, aside from wine?) We are thankful for Nicolas Cage! That’s right, dear listeners! 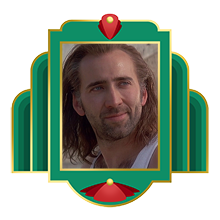 This week, we give you part one of a massive two-part joyfest about Nicolas Cage. And joining us for this endeavor is special guest star, Noel Thingvall: Master of Two-Part Episodes. If you would like to drink along, we recommend Barefoot Refresh Crisp Red, which is basically wine soda. Or, if you would rather stay on the non-alcoholic side, we recommend either strawberry kiwi juice or Mendota Springs sparkling water.